Designed by renowned architect Don Pederson, this 3bed/2.5bath contemporary home boasts attention to detail in every corner. The residence is ~1,957 sq. ft. and is tucked privately off Pedregosa Street in Santa Barbara's desired upper east neighborhood. The best way to describe this property is a seamless transition from natural beauty to new age architecture. The current owners have cared for and dramatically improved this home. 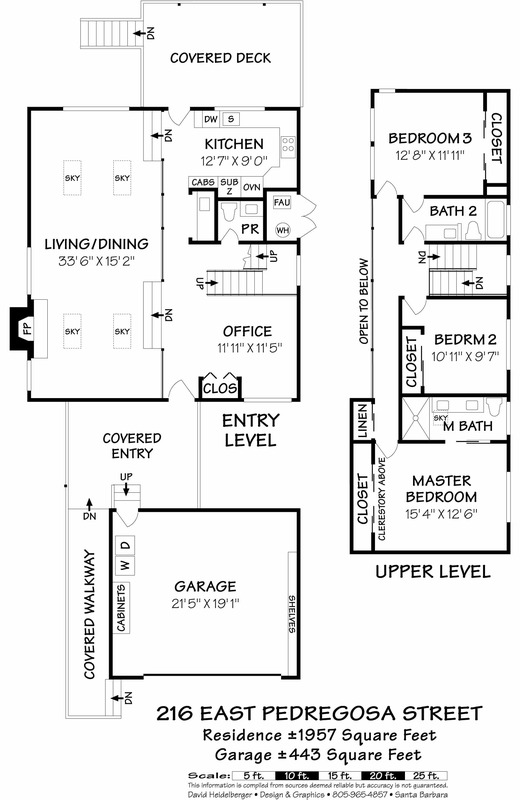 The downstairs consists of a formal living room, dining area, office, 1/2 bath, wet bar, and gourmet kitchen. Off the kitchen is a stunning covered deck with steps to the secluded backyard. The backyard features accent lighting, pathways, artificial grass, and a breathtaking California oak tree. The upstairs features 3 bedrooms and 2 full baths. Both bathrooms have been beautifully remodeled. Additional features include: contemporary glass garage door, new roof (2009), all operable windows were replaced, re-stuccoed entire house to a smooth surface, newer hot water heater, and much more! There is a detached 2-car garage w/laundry and ample off-street parking. 216 E. Pedregosa Street, Santa Barbara, CA from Mike Richardson, Realtors on Vimeo. House Size: ~1,957 sq. ft.